This deep-south mystery has all the elements of a great, suspenseful novel: A brave kid main character, an unknown but evil bad guy, nasty people, helpful hints, a unique and clearly-described setting, and dog biscuits. Well, here's the thing: The whole story is told by a dog! Yep, Bowser the mutt is not only the narrator of our story, but one of its heroes. Along with his new girl (owner) Birdie, they need to solve a robbery and save the swamps near their home. By the way, this takes place in the gator-infested swampland of rural Louisiana. As long as Bowser gets his treats and a chance to pee on the tree in front of their house, it's all good. Not only is it creative and interesting to have the dog tell the humans' tale in his own words, but it works far better than you would expect. 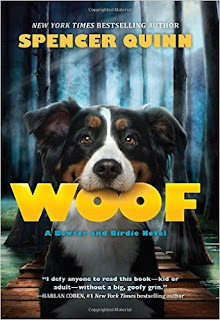 It's hilarious, too, as the author gives us a true dog's-eye-view, from sniffing butts to getting totally distracted by squirrels. Bowser's love for Birdie shows through too, and this is a winner for dog-lovers and mystery fans alike.